An ethics reform package aimed at cleaning up state contracting practices, including alleged practices under the spotlight of a federal corruption trial of Tony Rezko, could make its way through the General Assembly very soon. The so-called pay-to-play measure would ban political contributions to statewide officeholders from any business with more than $50,000 in contracts awarded by that office. The business’ contracts with the state would be canceled if they broke the law. Family members of the contractor also would be banned from donating to the officeholders. Senate Majority Leader Debbie Halvorson, a Crete Democrat, all but dared Gov. Rod Blagojevich to veto or alter the bill in an attempt to “improve” it, as he has with other legislation. “Let him try it,” she said a Statehouse news conference Wednesday. Chicago Democratic Rep. John Fritchey, the House sponsor, vowed that his chamber would override a veto, while the Senate sponsors said they would attempt to get enough votes but couldn’t promise them. A deal is a long time coming. Lawmakers have debated this version of ethics reform for three years. But the measure gained momentum this year because of the Rezko trial, which includes allegations of exchanging campaign contributions for state contracts and jobs. It's also an election year. “There’s a good chance it may be snowing in hell right now,” Fritchey said of the timing. Sen. Don Harmon, an Oak Park Democrat and sponsor, said the bill will be heard in a committee next week. He said Senate President Emil Jones, a Chicago Democrat and Blagojevich ally, wanted the bill “improved” even more but that Jones wouldn't stop the measure from advancing to the House. Fritchey said he expected the proposal to move soon. The Illinois House could be in Springfield all weekend to approve a constitutional amendment that would give voters the right to recall elected officials. The Senate proposal would allow voters to recall elected officials, including local politicians and judges. It also would link the lieutenant governor and the governor, which Sen. Rickey Hendon said was because the two officeholders are elected in the general election together (although they're not considered running mates in the primary elections). Under Hendon's proposal, if the governor were recalled, the lieutenant governor would be, too. The House version, sponsored by Rep. Jack Franks, a Woodstock Democrat, is directed only at statewide officeholders, not local officials and judges. That measure is stuck in the Senate. Many supporters and opponents of the measure said any change would be better than the existing system, which has resulted in a draw out of a hat three consecutive times because lawmakers hit a stalemate. “Determining the future of Illinois based on the flip of a coin is irresponsible,” said Rep. Lou Lang, a Skokie Democrat, during debate. Rep. Barbara Flynn Currie, a Chicago Democrat, said the framers of the 1970 Illinois Constitution thought that the tie-breaker provision would be enough to make any sensible, responsible party compromise. “It turns out, we’ve had three opportunities. And three times, we’ve struck out.” She said the proposal would “do the job” in forcing a compromise. Under the plan, sponsored by Rep. James Brosnahan, an Evergreen Park Democrat, a stalemate over who would redraw the map would result in the Illinois Supreme Court appointing a “special master” to oversee the process. Each chamber of the General Assembly also would approve its own map with a three-fifths vote. Opponents said the proposal lacks specificity in multiple areas, including the role of the state’s high court and the criterion for selecting a special master. The House approved the measure, 98-10 with one voting present, but House Minority Leader Tom Cross, an Oswego Republican, said the bill is presumed dead on arrival in the Senate. Even if approved by both chambers, 60 percent of the public would still have to vote for the idea before the state Constitution could change. Only 19 senators voted in support of asking the public whether the state should allow a graduated income tax rate to replace the existing flat rate. That’s far short of the 36 votes needed, indicating most senators are unwilling to support something that looks like a tax increase right now, particularly during an election year. “I just think we need to escape the politics of self-preservation,” Sen. Kwame Raoul, a Chicago Democrat and co-sponsor of the measure, said after the vote. He and Sen. Michael Frerichs, a Champaign Democrat, said they pursued the constitutional amendment to give the state flexibility in revising its tax structure so that it could establish a system less reliant on local property and consumption taxes, which often burden the low- and middle-income taxpayers. Republicans voiced opposition to the measure because they said it would pave the way to increased income taxes. That would be a “killer” for small businesses and job creation, said Sen. Kirk Dillard, a Hinsdale Republican, during floor debate. Republicans also said the proposal fails to address high property taxes and lacks details, leaving voters vulnerable to a tax-and-spend approach to state government without public input. Another income tax proposal, meanwhile, is still in the works in the House. It originally tried to set new, tiered rates for individuals making more than $250,000 a year, but it narrowly failed. It’s expected to come back in some form. Watch for more updates regarding Senate action on another constitutional amendment to let voters recall elected officials and on ethics reform to ban so-called pay-to-play politics. The Illinois Senate is expected Tuesday to vote on a proposal to change the Constitution so that the state could have a graduated income tax rate rather than the current flat rate (3 percent on individuals and 5 percent on corporations). That's according to the sponsors of the proposal, Democratic Sens. Michael Frerichs of Gifford and Kwame Raoul of Chicago. Both Senate sponsors said in a Statehouse news conference Monday that they did not introduce the constitutional amendment to increase taxes as a way to generate revenue for any specific purpose, although they both support a graduated income tax rate. And they acknowledged that such a system eventually would lead to increased taxes. They want to establish what they said would be a fairer tax structure, given that the existing system relies on local consumption taxes that often burden low-income residents. The measure previously advanced out of a Senate committee (see our previous blog post for more), something the sponsors say gives them hope that the full chamber can do the same Tuesday. While the sponsors said they were counting on one Republican vote in support of the measure, it would still need more GOP support to pass the House with the necessary three-fifths vote. Then it would have to win support from of at least 60 percent of voters in the next election. Gov. Rod Blagojevich escaped what would have been a media frenzy today by sneaking around Springfield for the annual Governor’s Prayer Breakfast and, according to the first lines of his speech, holding another meeting in the governor’s mansion about a state capital plan. His office provided audio of the nine-minute speech, and spokeswoman Rebecca Rausch said he then met with labor leaders about capital. He was back in Chicago by noon. The Statehouse press corps didn’t know about the events until after the fact. The quick in-and-out allowed him to avoid reporters who would have followed his every move to ask him to respond to Tuesday’s news — a political insider pleaded guilty and indicated that Blagojevich knew of an illegal deal to exchange a high-level state job for campaign contributions. Ali Ata, former executive director of the Illinois Finance Authority, pleaded guilty to lying to federal investigators and fudging his federal income tax return. The federal probe is separate from but related to the case called “Operation Board Games,” involving Antoin “Tony” Rezko’s alleged influence in state business and campaign fundraising. Here’s that indictment, again. Ata’s plea agreement indicates Rezko was instrumental in hiring Ata as executive director of the Illinois Finance Authority in exchange for his hefty contributions to Blagojevich’s political campaign. The state agency formed in 2004 and finances about $3 billion in projects for economic development each year. The plea agreement said Ata met with Rezko and “Public Official A,” identified as Blagojevich, before Blagojevich was elected governor in 2000 or 2001 to talk about supporting his political campaign. They later talked about granting a state position in return. Donations came in chunks as large as $25,000, as seen in Illinois State Board of Elections records. You can search all of Ata’s campaign donations here. Type in his name and scroll down to see his July 25, 2005, donation of $25,000 to Friends of Blagojevich. In one conversation, Ata said he would accept a position within the administration, and Blagojevich allegedly said it had “better be a job where [Ata] could make some money,” according to the plea agreement. Ata allegedly was told he could head the Illinois Finance Authority as long as he agreed to report to Rezko. He officially was appointed in January 2004. The plea agreement says Ata believed that he needed to please Rezko to keep his job. That involved donating about $125,000 to Rezko between 2003 and 2004, while he led the state agency. Ata faces up to eight years in federal prison and up to $500,000 in fines. He’s fully cooperating with federal authorities. The more that unfolds in the federal investigations surrounding the Blagojevich Administration, the more ears might perk up at the sound of “recall.” That would allow voters to kick someone out of office, but it requires a change in the state Constitution, either through an individual amendment or through a constitutional convention. Support for both could be growing, according to a survey by the Institute of Government and Public Affairs at the University of Illinois at Springfield. A convention would allow elected delegates to rewrite the entire state Constitution. And a majority of the public would have to approve the new charter. Debate within the Capitol includes whether such emotional voting would lead to undesirable consequences in the long run. Whether the public likes or dislikes Blagojevich, changing the state Constitution to allow a recall of constitutional officers or state lawmakers — or any elected official, as proposed in the state Senate — could forever change the way elected officials behave. Supporters say that change is good because it would remind public officials that they always are accountable to the people who elected them. Opponents argue that change is bad because it would make public officials even more paranoid about voter dissatisfaction and, in turn, lead them to do whatever it takes to ensure they’re reelected. See more in the upcoming Illinois Issues magazine in the first week of May. Update: Action was taken on several on several items from yesterday's contentious Senate committee, the new information is below. Dark shades blocked the sunshine from entering a packed committee room at the Capitol Wednesday, when a nasty political storm between Senate Democrats exposed reasons the legislative process has been so frustrating the past few years. It’s interesting that the Democrats easily approved a constitutional amendment to allow a progressive income tax, potentially affecting taxpayers statewide. Yet, they spent two hours personally attacking each other while debating a constitutional amendment that would allow voters to kick them out of office in a recall election. The threat of losing office strikes a deep nerve. Constitutional amendment 28 The two-hour debate about a recall provision to the state Constitution was, at times, laughable at the same time it was inappropriately personal and egotistical. It’s all rooted in political vendettas and perception of power. More than once, Senate President Emil Jones Jr. had heated exchanges with Lt. Gov. Pat Quinn, who publicly stated that the Senate was “up to shenanigans” and intended to kill the recall measure. Jones said that was wrong and disrespectful and called for an apology, which he never got. At another point, Sen. Iris Martinez, assistant majority leader from Chicago, said she would lead a recall effort against the Democratic sponsor, Rep. Jack Franks of Woodstock, because he supported her opponent in the last election. Although dramatic, the back-and-forth banter did raise an important question: Which officeholders should be eligible to be recalled? The version that won House approval last week includes statewide officeholders — the governor, lieutenant governor, attorney general, secretary of state, comptroller and treasurer — as well as individual legislators. But it does not include judges and local officials. Sen. Rickey Hendon and Sen. Donne Trotter, both Chicago Democrats, are changing the measure to include judges and local officials. Franks, Quinn and Watson said after committee that they believed — and that it would be perceived — that the changes were intended to bog down the measure so that the recall provision wouldn’t have enough time to be approved by both chambers before May 4. Constitutional amendments must be approved by then to appear on the November ballot. Trotter flatly denied that perception, saying, “I did not pick up this bill to kill it.” He added that he intends to make the bill “better” and that there’s a “sense of unreadiness” to advance the measure. That’s especially because the House sat on it from August until last week and left little time for the Senate to consider it. So Trotter held the measure in committee, meaning it has to move through both chambers in the six session days scheduled before May 4. Update: The bill has been moved to final passage stage in the Senate. It must pass both chambers by May 4th. But the constitutional amendment would not set new tax rates or income guidelines. Those would be up to legislators to debate and put into law once voters approved the change to the state Constitution. Sen. Christine Radogno, a Lemont Republican, opposed the idea of going to the voters right now for that reason. “We’re putting this question that has very broad implications to a body and a government right now that people don’t have confidence in, and they have no control over the outcome of this process once it starts,” she said. Business groups oppose the measure. Update: The bill was moved to final passage stage in the Senate. HB 824 The Senate committee unanimously approved a measure to ban so-called pay-to-play politics, or trading campaign contributions for state contracts. Like a House version (HB 1) that received unanimous support last year, the Senate measure would prohibit businesses from donating to political campaigns of officeholders whose offices grant the contracts. It also would ban political contributions to candidates for the office that would grant the contract, as well as contributions to statewide political parties that can fund the officeholders. Stronger disclosure provisions would require companies with state contracts worth more than $50,000 to report political contributions to the Illinois State Board of Elections. Sen. Debbie Halvorson, a Crete Democrat and congressional candidate, has taken some heat in the press for not allowing the House version to move in the Senate. She said during committee, “Our frustration has been that nobody believes that anybody really wants true reform, which is absolutely not true. We want it. We’re going to get it.” She said she believed this version could win approval by both chambers. Senate Minority Leader Frank Watson of Greenville wasn’t so confident, saying politics between the two chambers could prevent any ethics reform from being enacted. Radogno, the deputy minority leader, added that a more comprehensive measure that includes pension reforms also sits dormant even though it already worked through the House and the Senate. But it can’t move to the governor’s desk until the Senate approves the same language as the House. Update: The attempt to exempt river boats failed in the Senate. SB 2707 Illinois’ riverboats would be allowed to let patrons smoke inside for five years under an exemption to the statewide smoking ban, as approved by the Senate committee on a vote of 7-6. Minority Leader Watson, the sponsor, said the exemption would help riverboats recoup millions of dollars lost after the smoking ban took effect. When riverboats lose money, the state collects less gaming tax revenues. Opponents argue that the decrease in gaming revenues is rooted in the slowing economy, not an effect of the smoking ban. Update: The House has also rejected the reorganization plan. Executive Order 801 A Senate committee rejected Gov. Rod Blagojevich’s executive order that would combine functions of three more state agencies, intended to save about $121 million. He previously consolidated the procurement and human resource functions of the revenue and the corrections departments but drew criticism from labor unions, which fear more consolidations would result in job losses and loss of services. A House committee approved a universal health care plan yesterday, but the proposal may have more to do with politics than policy and appears to have little chance of advancing. The measure, HB 311 called the Healthy Illinois Act, seems headed for debate in the full House, however. House Speaker Michael Madigan and Majority Leader Barbara Flynn Currie added themselves as sponsors to the measure Monday. Madigan previously criticized fellow lawmakers for not being able to make tough political decisions and cast tough votes. Health care has become an important issue this year, and efforts by Gov. Rod Blagojevich to expand the state’s programs have met resistance from courts and from lawmakers. The health care plan that advanced out of committee Tuesday, however, would constitute a much larger expansion of health care than the governor’s proposals. The measure, sponsored by Rep. Mary Flowers, a Chicago Democrat, would abolish private ownership of for-profit hospitals. Nicholas Skala of Physicians for a National Health Plan said the plan would combine taxpayer money with employer contributions and a payroll tax to fund the system. The cost is unknown, but supporters said it would help lower costs and eliminate administrative waste. The system would absorb all health care spending in the state, which was last measured at $64 billion in a 2000 study. After sitting on the measure since last January, Flowers said she brought the proposal to the committee because of health care horror stories in her district. On the same day Gov. Rod Blagojevich issued a massive executive order to combine more state agency functions, a Cook County judge ordered that Blagojevich’s administration has to stop expanding a state health program to middle-income adults. But that’s not going to stop Blagojevich from trying. In the meantime, residents who already started receiving state-sponsored health care under the governor’s expansions are left in limbo over whether they’ll continue to receive those benefits. We'll have more on the governor's move to consolidate state agency functions tomorrow. It’s a mess. The governor’s office already issued a statement that said it would address the judge’s concern about his health care expansions and continue to expand the FamilyCare program to more families. (The administration also announced a statewide tour about health care, seen here.) Legislators, in the meantime, continue to say they support health care but oppose the way the governor goes about expanding it without a way to pay for it. Tuesday’s court order is only one of two lawsuits involving the governor’s authority to expand health care through executive power rather than through the legislative process. The governor also sued Secretary of State Jesse White for not publishing rules to implement the expansions, preventing the administration from acting. White’s legal team has until May 2 to respond to the governor’s lawsuit. On Tuesday, Cook County Judge James Epstein technically didn’t rule on whether the governor could expand health care programs without legislative approval. On one hand, he decided that the administration was within its rights to extend an existing program for breast and cervical cancer screenings to women age 65 and older. He said the legislature approved $6 million for the program without imposing limits, allowing the department to expand the benefits as long as it was within that $6 million appropriation. On the other hand, Epstein denied the governor’s ability to expand FamilyCare, which would offer state-sponsored health insurance to 147,000 adults from middle-income families for about $43 million in the first year. Because the FamilyCare program would offer state and federal Medicaid benefits to adults making up to 400 percent of the federal poverty level, the program would have to abide by federal income limits and work requirements. This is technical, but the judge ruled that because the FamilyCare expansion as written doesn’t require the adults to be “employed or engaged in a job search,” the expansion fails to meet federal requirements and wouldn’t be reimbursed. That means the administration is prohibited from expanding FamilyCare until a full trial decision or until the department changes or cancels the expansions. Epstein’s ruling also said that complaint filed by Richard Caro, a Riverside attorney, and by Republican businessman Ron Gidwitz and Greg Baise, president and chief executive officer of the Illinois Manufacturer’s Association, on behalf of the Illinois Coalition for Jobs, Growth, and Prosperity, likely would succeed in a full trial. State Rep. Lou Lang, a Skokie Democrat, is a member of the Joint Committee on Administrative Rules that repeatedly rejects the governor’s executive power in trying to expand health care. He’s also sponsoring legislation that would do the same thing the governor is trying to do through his administrative powers. It hasn’t gone anywhere, but Lang said lawmakers would be more likely to help him accomplish his health care goals if the governor would sit down and negotiate. More than 100 new American citizens rallied at the Statehouse today to lobby lawmakers on behalf of legal and undocumented immigrants. They included Korean, Polish, Mexican, African and Arab immigrants who recently became citizens through the state’s New Americans Initiative, a program designed to help immigrants navigate the citizenship process. The Illinois Coalition for Immigrant and Refugee Rights sponsored the day, in part to voice opposition to a House proposal that directs the state to report undocumented immigrants convicted of crimes to the federal government for deportation. The coalition also wants lawmakers to provide an additional $500,000 in funding for the state’s citizenship program to address the growing number of applicants in Illinois. Applications in Illinois have doubled during the national debate over immigration policy by some estimates. The coalition also wants to push a proposal that would allow undocumented detainees to have greater access to clergy and other religious counsel while in jail. A House committee is scheduled to hear the plan tomorrow. Thursday’s House rejection of a new state income tax structure isn’t a done deal. We knew it could come back in some form, but Rep. Gary Hannig, a Litchfield Democrat and deputy majority leader, filed a “motion to reconsider” after yesterday’s vote. (Scroll to the bottom of this page to see record of Hannig’s motion.) The maneuver allows the chamber to take another whack at the same legislation, maybe with some changes. Twice last year legislators used the motion to block legislation from advancing even though it received enough votes to pass. Senate Democratic leadership halted an electricity rate deal from advancing to accommodate a particular utility (scroll down to "procedural maneuvering"). Downstate House members stopped a budget deal from advancing to gain leverage for electricity rate relief. Hannig’s move was the opposite. The income tax measure failed, and Hannig was one voting against it. He said in a phone conversation Friday that he told the sponsor, Rep. Mike Smith, a Canton Democrat involved in education matters and passionate about education funding reform, that he agreed with him philosophically but didn’t think the constitutional amendment was ready to go on the ballot. So Hannig voted against the measure, but he filed a motion to reconsider so that Smith would have an opportunity to bring the measure back with some changes that potentially could change some Democratic and Republican “no” votes to “yes” votes. So, yes, you can bet on Smith’s measure coming back sooner rather than later. Constitutional amendments must be approved by both chambers before May 4, and given that the measure still needs to be revised, approved by the House, read three different times and approved in the Senate, with a week off April 21-25, Hannig said the House would need to reconsider the measure rather quickly. “The lawsuit, filed at the governor’s direction, is an explicit statement that he does not want executive agencies to work in a cooperative manner with the legislature,” he wrote. The governor’s office did not return a phone call. 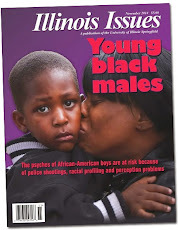 Watch Illinois Issues magazine for more about the implications of the lawsuit. The battle that ensues every 10 years to draw the map for legislative districts could be solved by more than names drawn from hat if a new measure becomes law. The proposed constitutional amendment has the support of House Speaker Michael Madigan, according to Mike Lawrence, director of the Paul Simon Public Policy Institute at Southern Illinois University Carbondale. Lawrence, long-time journalist and former spokesman for then-Gov. Jim Edgar, says the proposal would take the element of chance out of the controversial task of updating district boundaries every 10 years. And it would be designed to make it easier for the two chambers to compromise. Currently, both chambers must agree on the same map. Under this proposal, the House and Senate would draw and approve separate maps, essentially controlling their own destinies. If the two parties can’t agree on how to compose the map, two Illinois Supreme Court justices would appoint a so-called special master to redraw the map. The special master usually is a lawyer, Lawrence says. Since 1981, lawmakers have come to a standstill three times. So they randomly drew from a hat to pick the winning party that would redraw the map. Control of the process typically benefits that party, often because districts are oddly designed to produce certain results. For the state’s Republican Party, the next redistricting in 2010 may be especially important because of the changing demographics of Illinois, particularly in the Chicago suburbs. The Pew Research Center, a nonpartisan think tank in Washington, D.C., reported last month that self-identified Republicans account for only 25 percent of Illinoisans. Democrats account for 35 percent, and independents 40 percent. As more people leave Chicago and Cook County for the suburbs, Democrats gain strength in the suburban counties. Lawrence says the plan would take some of the political venom out of the process and restore geographical sense to the map. A House committee will hold a public hearing on the measure next week. At the same time Gov. Rod Blagojevich and top Democrats and Republicans met in his Statehouse office to talk about a long awaited capital plan, House members one floor above rejected an idea Thursday to help pay for it. Members of both political parties voted against letting voters decide whether to increase the state income tax rate for the wealthiest citizens. After the vote, House Speaker Michael Madigan walked out of the Capitol without attending the leaders’ meeting. It appears last year’s political fissure between the speaker and other leaders and the governor still exists, and maybe even deepened. House Majority Leader Barbara Flynn Currie attended the meeting instead. Former U.S. House Speaker Dennis Hastert and Southern Illinois University President Glenn Poshard attended the meeting as part of Blagojevich’s plan to move along negotiations with bipartisan input. After more than an hour, House Minority Leader Tom Cross came out of the meeting and said nothing substantial was discussed beyond the scope of a $10 billion plan, the same number mentioned last year. Cross also said the deal would be a consensus proposal designed so it wouldn’t have to be changed in either chamber, indicating long negotiations given the non-existent relationship between Madigan and Blagojevich, as well as between Madigan and Senate President Emil Jones Jr. They scheduled another meeting for next week. Hastert and Poshard also are holding more public hearings around the state. The so-called graduated income tax was expected to fail. Even the Democratic sponsor, Rep. Michael Smith of Canton, said he wasn’t surprised, that he knew some Democrats would vote against the idea and that Republicans would band together to reject it. The measure would have created two brackets for the state income tax, applying a 3 percent rate on those making less than $250,000 and a 6 percent rate on those making more. Projected to generate $3 billion, it would have been split equally on education, a statewide capital plan and tax relief with an increased personal income tax exemption. If legislators approved the idea, voters would see the question on a ballot asking them whether to change the state Constitution, which currently applies a 3 percent flat rate regardless of income level. "We built too many prisons"
A controversial plan to shut down part of the Stateville prison in Joliet became just a bit more contentious after a packed meeting at the Statehouse Wednesday. Department of Corrections Director Roger Walker told a House committee that the reclassification and transfer of more than 1,000 maximum security prisoners and the relocation of hundreds of employees was being done partly to justify the state’s $140 million new prison in Thomson. Walker said that he inherited the newly built prison when he took over the agency and he “had to use it.” The statement caused more than a little discontent from the hundred-plus group of American Federation of State, County and Municipal Employees members who witnessed the testimony. The union is fighting the plan, saying it will cause disruptions for workers’ families and for inmates, leading to more dangerous inmates. The facility in Thomson was completed in 2001 and remains empty, and the Illinois Department of Corrections plans to transfer 200 inmates from Stateville to open the new facility. Prison workers would also be moving with the inmates, but there will be room for far fewer workers at Thomson than would be dislocated by the plan. Gov. Rod Blagojevich said the closing of Stateville’s maximum security wing would help the Department of Corrections save $31 million in operating costs by using the newer facility in Thomson. Stateville was built in 1925, and the state estimated it would cost $108 million to renovate the prison. Henry Bayer, executive director of the AFSCME council that represents the Stateville employees, said the plan is dangerous because it also transfers maximum-security inmates to crowded prisons in Menard in Randolph County and near Sumner in Lawrence County. The union also accused the agency of reclassifying violent inmates to lower security levels to make it easier to transfer the prisoners to less secure facilities in the state. Bayer also says the state inflated the amount of money it would take to renovate Stateville to make it easier to shut down a portion of the prison. Walker said the prison is outdated and that the budget savings will help pay for 765 new positions in the understaffed agency. Bayer said the lack of staff forced correctional workers to log 700,000 hours of mandatory overtime in fiscal year 2007, which he said cost the state $24 million. Chicago-area legislators try every year to approve gun control measures. They narrowly rejected two this afternoon, and they could get another chance to vote on another measure Thursday. The effort highlights the striking fact that 20 Chicago Public School students have been killed by gun violence this year. Downstate lawmakers often oppose gun control measures because they have potential to reshape civil rights to own guns and to affect people who hunt for sport. Cullerton said momentum could swing the other way after the November elections, particularly in the Chicago suburbs where Democrats are gaining hold. “Maybe next year after there are some changes in the legislature, we’ll have enough votes to pass them,” he said. Context: Individuals would be limited to buying one handgun a month under a measure sponsored by Rep. Louis Arroyo, a Chicago Democrat. He intends to help prevent the number of illegal handguns spreading through the city and state. Republicans oppose the measure, saying it wouldn’t accomplish what it’s designed to do. They cite gun collectors who might buy multiple guns at one time, and they fear for the civil right to own a handgun for protection. Rep. Mike Bost, a Murphysboro Republican, said: “This is an issue of personal rights. The legislator, though well intended, has already admitted that handguns are already illegal in Chicago. This is not going to change that. All it does is infringe on those people I represent.” Rep. David Winters of Shirland, near Rockford, said some GOP lawmakers would consider supporting a measure with a less stringent limit, such as one gun per day. The Illinois State Rifle Association also opposes the measure as ineffective and affecting only law-abiding citizens. Criminals would simply get their guns from other states, the association says. Status: It narrowly failed in the House Wednesday afternoon. It’s expected to come back for another vote. Context: Cullerton said Tuesday that the measure with the most potential to advance through both chambers would mandate background checks for the sale of handguns from one private individual to another (both must have FOID cards). The private sale of guns would have to take place in a federally licensed dealer, triggering the automatic background check. The rule wouldn’t apply if a person sold a gun to another family member, including in-laws. The Illinois Rifle Association opposes the mandated background checks as “highly burdensome” for private citizens with no demonstrable effect on crime. The other sticky subject, however, is that the measure, sponsored by Osterman, includes controversial language that would prohibit the governor from using administrative rules to implement new policies. That might not fly in the Senate. Status: The measure, minus the language about administrative rules, narrowly failed twice last year. Osterman said he could call it for a floor vote if he thinks he has enough support. It’s going to be close. Context: The measure, sponsored by Rep. Edward Acevedo, a Chicago Democrat, would make it illegal to own, sell, manufacture or buy semi-automatic assault weapons or attachments, including any .50 caliber rifle or .50 caliber cartridge. The Illinois Rifle Association says the ban would affect popular sporting rifles and shotguns and include a registration system that would cost taxpayers $300 million a year, as well as that it has no demonstrable effect on crime. Status: The measure stalled in the House so far this year and stalled in the Senate last year. Gov. Rod Blagojevich’s health care plan emerged in Plan D today (we wrote about Plan C last fall). But the administration may have to develop Plans E, F and G before his desired expansions become law. The health care plan was repeatedly denied as an executive order and even challenged in federal court, but it reappeared in the legislature and received Senate approval along partisan lines Thursday. Democrats voted “yes,” and the package includes incentives for House Democrats to support the expansions by including money for projects in their districts that the governor vetoed out of last year’s budget. But the one-time funding sources and the increased spending is likely to stall in the House, to put it nicely. Senate Democrats announced the package would offer $530 million for member initiatives, but they would rely on so-called fund sweeps. This and previous administrations have skimmed “surplus” money from dedicated funds for such services as controlling pollution and preventing youth drug abuse. Those funds accumulate money through licensing fees and a variety of sources that are supposed to pay for the costs of regulating and operating those services (see background on fund sweeps here). The Senate package would declare some special funds off limits. They’re listed here and here. Skeptics argue that giving the governor a $530 million “blank check” has no guarantee he actually would distribute the money for projects in their districts. Senate Republicans renounced the plan for expanding health care when the state already is behind in reimbursing Medicaid providers and faces a budget deficit this year. State funding for the program, however, would be in jeopardy every year. Initial costs are estimated to be $43 million, but Senate Republicans estimated the cost of the program once fully implanted could reach $300 million. And there’s no dedicated funding source, argued Sen. Chris Lauzen, an Aurora Republican. But once lawmakers approve a health care program, it’d be politically difficult to cut funding in later years. So, as Link said, legislators would have to prioritize and cut where possible every single year. Some Senate Democrats commented that the entire package was bad for the state, but they voted in support of it anyway. It is an election year, after all, and playing along now could help them negotiate for things they want in next year’s budget, which starts July 1. Young adults up to age 19 who have chronic illnesses would qualify for All Kids benefits regardless of income or citizenship status. Under the existing FamilyCare program, families that live in Illinois, that have been uninsured for at least a year and that fall at or below 200 percent of the federal poverty level would qualify for state-sponsored health insurance. They would pay a monthly premium based on income. And all uninsured women could receive benefits under the existing Illinois Breast and Cervical Cancer Screening and Treatment program. In summary: The plan has little chance in the House, so it’ll be interesting to see what else the governor will do to push his health care expansions into law. He’s still got 22 letters left in the alphabet. Go ahead. Throw in your two cents. Illinois Issues magazine, with the Center for State Policy and Leadership at the University of Illinois at Springfield, now accepts comments on the Illinois Issues Blog. Our Statehouse bureau has blogged since spring 2006. After two years, we’re still learning and experimenting with ways the blog can augment Illinois Issues magazine and the Web site — http://illinoisissues.uis.edu. But we realize that what sets the blog apart is its ability to allow author and reader to interact in real time. Readers can respond to stories, correct mistakes and — most important — add to discussions. We encourage thoughtful comments as part of our mission to engage readers in dialogue and enhance the quality of public discourse. Go ahead. Comment. We’re eager to hear from you. Lawmakers: Can you follow the money? Lawmakers still don’t know why Gov. Rod Blagojevich gave a $1 million grant to the wrong organization. The administration sent Deputy Gov. Louanner Peters to take the grilling Wednesday before a House committee, whose members say there are more questions now than before the hearing. Peters testified for more than an hour but provided little new information about the grant to the Loop Lab School in Chicago. The governor said that the money was supposed to go to rebuild the administrative offices of Pilgrim Baptist Church in Chicago after a fire gutted the building. The school was renting the office at the time. Beyond a history lesson about the landmark building, Peters continually cited an ongoing investigation by the Illinois Department of Commerce and Economic Opportunity that she said prevented her from discussing the grant. She couldn’t say how long the investigation would take. She referred to John Filan, chief financial officer of the state, who oversees the department but who wasn’t there to answer questions. Peters dutifully responded to every inquiry, mostly referring questions to the administration’s lawyers. Peters also compared the grant in question to the pet projects of legislators, saying there was little oversight over those projects. The stonewalling was complete when Peters and another administration official raced out of the room after the hearing without taking questions. It’s still unclear how the school, a separate entity from the church, ended up with money instead. The governor previously called it a “bureaucratic mistake” that was handled by two former employees. Rep. Jack Franks, a Woodstock Democrat and frequent Blagojevich critic, scheduled the hearing. He said real estate documents show the property went into foreclosure two months after the school paid John Thomas $1.3 million for the second floor of the building. The Chicago Sun-Times reported, based on unnamed sources, that Thomas was an FBI informant in the current federal trial of Blagojevich insider Tony Rezko. Franks questioned Peters on what he deemed inconsistencies in the governor’s account of the deal, saying the grant was fast-tracked and ignored obvious “red flags” in the school’s recent past. Franks said the grant never should have gone through because a cease and desist order related to a sexual harassment charge against the school was on record. There also were concerns over a felony conviction of a school administrator who the governor later pardoned. The school currently isn’t operating. Franks promised more meetings on the subject and requested a list of documents from Peters for a future hearing. “We need to find out if this was a mistake or if it was done on purpose,” he said. At the same time next door, more House members heard that the longer it takes to approve a statewide capital bill, the more likely the state will have to pay top dollar for unanticipated emergency repairs to state buildings, including schools. The agency seeks $2 billion for its portion of the capital plan, but Grimes said it’s up to legislators to approve the funding source. So far, that's selling the Illinois Lottery or expanding gaming. Both are buried in politics, which promise to drag out the debate and leave public buildings waiting for a long time. Constitutional Amendment 28: If voters believe a constitutional officer or a state legislator is taking the state in the wrong direction, Franks, the Woodstock Democrat, says they should have the ability to recall that official and elect a replacement. The so-called recall provision would require voters to approve a change in the state Constitution. The legislature has to approve Franks’ measure for a ballot to pose the question of whether to allow a recall. The Illinois House continues to consider Franks’ measure and changed it Wednesday to remove judges from the measure, but it still has a long way to go. Eighteen other states have a recall provision, according to Franks. Opponents argue that voters already have the ability to kick officials out of office. “It’s called an election, frankly,” said Rep. Al Riley, a Matteson Democrat, during debate. Rep. Jay Hoffman, a Collinsville Democrat, added that a recall provision could lead lawmakers to become even more paranoid that they would lose their seats for disagreeing with their constituents. Franks said it’s an “extraordinary measure that shouldn’t be taken lightly” and isn’t meant to be used if voters simply hold a grudge against a particular candidate. He added that a recall provision is necessary to regain voters’ trust in government, particularly given the recent series of federal investigations into state officials, including the current and past governor. Lt. Gov. Pat Quinn supports the idea, and the governor has said he too would support a recall provision. The measure's future in the Senate could be bleak if Senate President Emil Jones Jr., who was a Blagojevich ally in the past, chooses not to call the measure for a vote. Lang pointed to a similar proposal he floated last year to revamp the Illinois Gaming Board in the name of making it more independent and shielded from political influence. That's still in the House, too. SB 1979: Homeowners in need of financial assistance to avoid losing their homes would receive grants under a measure approved by the Senate. Sponsored by Chicago Democratic Sen. Rickey Hendon, it would allow grants to lenders if the lender agreed to freeze the foreclosure process and negotiate with the homeowner. It now goes to the House. SB 1881: Bail would be denied to individuals who make terrorist threats of large-scale violence, such as the threat made last month at Southern Illinois University in Carbondale, under a measure approved by the Senate. The sponsor, Alton Democratic Sen. William Haine, said the proposal would slow down the legal process so threats of campus violence could be investigated properly. SB 2006: Another attempt to relax the state's smoking ban, this one to allow veterans' homes to permit smoking, passed the Senate. Sponsored by Rushville Democratic Sen. John Sullivan, the proposal is one of multiple attempts to change the law to allow some groups to smoke in public places. HB 5038: The state would dedicate more money to education programs aimed at children age 0 to 3 under a measure approved by the House. Funding programs for the youngest children is a growing trend as more research shows the earliest investments pay off in the long run (see Illinois Issues, April, page 6). It now goes to the Senate. HB 4705: The House also unanimously approved an extension of Blagojevich's first-term program Preschool for All, which first funds state-sponsored preschool for children from low-income neighborhoods who are considered at risk of academic failure. The extension, albeit by only two years, would allow Illinois to extend available funding to children from middle-income families, as planned when the governor initiated the first phase. HB 5898: The governor's annual budget proposal would have to include the amount of overdue bills and would require Illinois to pay bills within a month of being submitted under a measure approved by the House 101-3. It also would increase the interest rate if the state took more than 60 days to pay the bill. Rep. David Winters, a Shirland Republican, said he supported the measure because it would help make the state budget more transparent when Illinois lacks the money to pay for new programs. Rep. Elaine Nekritz, a Northbrook Democrat, voted present and said the proposal as written doesn't allow the state enough flexibility if it had a tight cash flow, a concern shared by the governor's budget office (scroll down to see the balanced budget note).